Port Harcourt, Rivers – It was a flawless victory for the students of the University of Port Harcourt as they dominated Zone D of the Nigerian University Games Association (NUGA) Preliminaries which was held on the 6th and 7th April at the High Performance Center, Uniport. The two day athletic event -which was one of many sports competed in- saw some of Nigeria’s finest and fastest athletes represent their school in the various event. It was a competition between Team Uniport vs The World. 3-time Commonwealth Youth Champion Aniekeme Alphonsus of Team Uniport dominated the 100m in a blasting time of 11.1s. Teammate Ifunaya Muoghalu finished 2nd in 11.6s while Team UniUyo’s Esther Dempster was 3rd in 12.6s. In the half lap race, Team Uniport’s Praise Idamadudu won in the women’s event. Aniekeme was 2nd while Dempster was 3rd. Praise Idamadudu took her second victory as she jogged the other ladies to win the 400m in 54.0s. Teammate Glory Patrick was in 2nd (56.5s) while Uniuyo’s Fabian Ekaete was far way in 3rd (63.7s). Team Uniport comfortably won the women’s 4x100m and 4x400m relay races leaving Team UniUyo and Team Unical to struggle for 2nd and 3rd but Team Uniuyo got the better of Unical in both races. Chinonso Nwocka was victorious in the 800m and 1500m for Team Uniport while Nation Junior Champ Uche Brown won the Long Jump and Triple Jump. On the men’s side, jaw breaking times were achieved especially in the sprints as Team Uniport’s Harry Chukwudike breasted the tape in a scorching time of 9.9s to finish first in the 100m ahead of teammate Idjesa Uruemu (10.1s) and Uniuyo’s Nsika Anthony (10.3s). In the 200m, Chukwudike Harry continued his fine form as he stopped the clock in 20.8s.Eseroghene Oguma also of TeamUniport was in 2nd (21.3s) while Team Uniuyo Nsika was 3rd (21.5s). Shedrack Ogbukwo and Kalu Chidozie made it a 1-2 in the 400m for Team Uniport in 48.3s and 49.4s. Team Uniuyo’s Brown Victor finished 3rd in 50.8s. Team Uniport’s Edidiong Udo was vidtorious in the 800m and 1500m while Oluwayemi Blessing won the Long Jump also for Team Uniport. It was a work over for Team Uniport in the 4x100m with Idjesa Uruemu, Eseroghene Oguma, Oluwayemi Blessing and Harry Chukwudike running a time of 41.0s to claim the victory while Team Uniuyo and Team Unical was 2nd and 3rd respectively. The relay quartert of Chidozie Kalu, Eseroghene Oguma, Adura Barry and Shedrack Ogbukwo won the men’s 4x400m. Team Uniuyo was in 2nd and Team Unical finished 3rd. 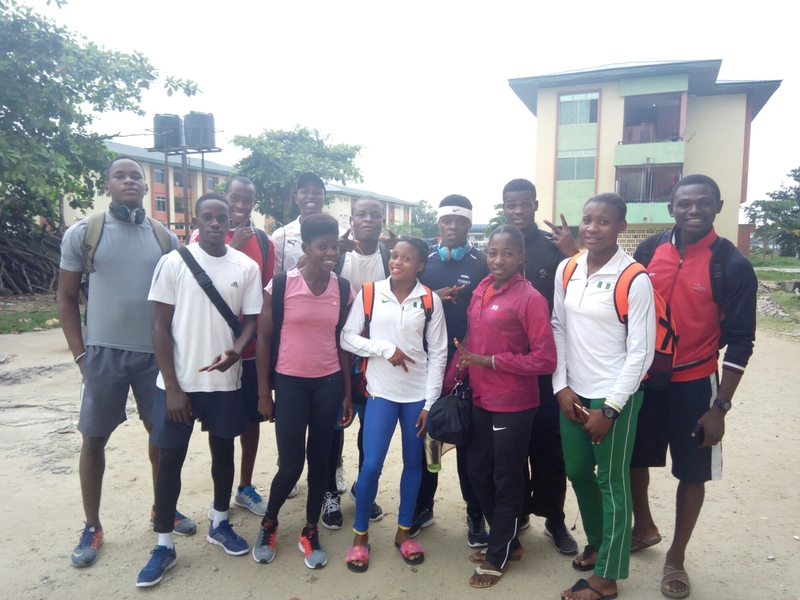 Team UniUyo’s men and women sprint relay team with thier coaches. In other events like Pole Vault, Women’s shot put, 10000m, 3000m, 400m hurdles, 100m hurdles only two athletes were available in each of these events and it was automatic qualification for them. It’s worthy to note that in other sports; Badminton, Chess, Swimming, Judo, Tennis, Table Tennis, Taekwando amongst others TeamUniport dominated in every category. 87 athletes represented the school and 86 of them qualified for the main Games. All road leads to Markudi for the Games which will take place between the 19th to 30th April but Athletics and Swimming will be in Abuja. Note: All times recorded were hand timed.